Born: 4 April 1857, Siegen, Germany. Died: 15 September 1936, Halle, Germany. Adolf Schenck (sometimes Adolph, or Schenk) studied at Ostern, Bonn and Berlin. He was appointed at the Mineralogischen Institute, Bonn, in 1884, where he obtained his doctoral degree. Late in 1883 the merchant Adolf Luderitz acquired from Nama chiefs in present Namibia a lease of Angra Pequena (the bay where the town Luderitz was later founded) and its hinterland, and secured the protection of his possessions by the German Government. He organised an expedition to explore this region, led by the mine manager H. Pohle* and including Schenck and the botanist H. Schinz*. They arrived in Cape Town in October 1884 and travelled to Angra Pequena in the ship Formica. Schenck and Schinz first travelled via Aus and Keetmanshoop to Stampriet (November 1884-January 1885), but Schinz was not satisfied with the plants he collected as the region was too dry. While Schinz went off to explore the northern part of the territory, Schenck and Pohle left the bay on 10 February 1885 and reached the site of Aus on 23 February. They continued their journay on 10 March, travelling first south-east and then south along the edge of the Namib desert to reach Obib (west of present Rosch Pinah) on 21 March and the Orange River near Sendelings Drift two days later. After returning half-way to Obib they turned slightly west of south, reached the Orange River again at Arris Drift (near present Beesbank), and, travelling parallel to the river, reached its mouth on 23 April. They returned to Angra Pequena along more or less the same route, without finding any significant mineral deposits. Pohle returned to Germany, but Schenck first visited the copper mines at Okiep, Northern Cape, in 1886. He then travelled via Natal and the Free State to the South African Republic (Transvaal), where he investigated the gold-fields at Barberton, Lydenburg, and the Witwatersrand. He also visited Botswana and Mozambique. Schenck's most important contributions to scientific knowledge of southern Africa related to its geology, but he also published on the geography and botany of the subcontinent. 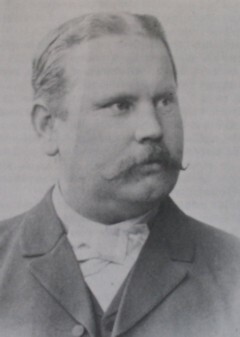 In letters published in the Zeitschrift der Deutschen Geologischen Gesellschaft (1885, 1886) and Petermanns Mitteilungen (1885) he described the occurrence of various gneisses in the region between Angra Pequena and Aus and introduced the terms Namaqua-Schiefer (shale), Namaqua-Sandstein (sandstone) and Namaqua-Kalkstein (limestone) for the horizontally disposed sedimentary succession underlying large parts of southern Namibia and now known as the Nama Group. His division of this succession into shale, sandstone and limestone units has remained more or less valid. He also pointed out that erosion and landscape formation in this whole region was affected mainly be temperature extremes and wind action, rather than by water. However, he regarded the extensive calcrete deposits as having been laid down in lakes which had later dried up. In 1888 he published "Die geologische Entwicklung S�dafrikas" (The geological development of South Africa, in Petermanns Mitteilungen), in which his views on the stratigraphy of South Africa were most fully developed. His recognition of five systems (Primary Formation, Cape Formation, Karoo Formation, Cretaceous Formation and recent deposits) attracted many followers and had a lasting influence on the geological nomenclature of the subcontinent. However, his Cape Formation, which included the present Witwatersrand Supergroup, Transvaal Sequence and Waterberg Group in addition to the Cape Supergroup, was much too inclusive and delayed a better understanding of the relationships between these rock groups. As part of his Primary Formation he gave the name "Swasischichten" (Swazi Beds) to the rocks of the Barberton Sequence, consisting of some of the oldest rocks on earth. He was the first to describe the geology of this region, six years after gold had been discovered at Barberton. This paper was translated into English by Reverend J. FitzHenry* and lauded as the best available outline of the geology of South Africa by the members of the short-lived South African Geological Association at their annual meeting in 1890. In 1889 Schenck published a paper dealing more specifically with the occurrence of gold in the Transvaal, in the Zeitschrift der Deutschen Geologischen Gesellschaft (1889). Other publications by him dealt with coal in South Africa (1888), the origin of laterite (1890), the Brukkaros volcano in Namibia (1901), and brief notes on a geological map of Namibia (1910). In 1899 he was a member of the Geological Society of South Africa. Schenck's geographical publications relating to the subcontinent included "Das deutsch-s�dwestafrikanische Schutzgebiet" (The German South West African colony, Verhandlungen der Gesellschaft f�r Erdkunde zu Berlin, 1889), "Gebirgsbau und Bodengestaltung von Deutsch-S�dwest-Afrika" (Mountain structure and soil formation of German South West Africa, Verhandlungen des 10 Deutschen Geographentages, Stuttgart, 1893), "Deutsch-S�dwestafrika im Vergleich mit dem �brigen S�dafrika" (German South West Africa compared to the remainder of South Africa, Verhandlungen des 13 Deutschen Geographentages, Breslau, 1901), "Die Boerenfreistaten S�dafrikas" (The Boer republics of South Africa, Geographische Zeitschrift, 1896), and "Die Kalahari" (The Kalahari, Geographische Zeitschrift, 1906). In 1903 he published a botanical contribution on South West Africa, consisting of six plates with descriptions of the vegetation of the territory, in Vegetationsbilder. Plant specimens collected by him are housed in the herbarium of the University of Zurich, Switzerland, while there are also some specimens in the herbarium of the Albany Museum, Grahamstown. Several plant species were named after him: Felicia schenkii, Sesamum schenkii, Anisostigma schenkii, Codon schenckii, and Parmelia schenckiana. After his return to Germany, in November 1889, he was appointed professor of geography at the University of Halle. His inaugural dissertation, Ueber glacialerscheinungen in S�d-Afrika (Halle, 1889) was a paper on glacial phenomena in South Africa. At some time he was the editor of the Mitteilungen der S�chsich-th�ringische verein f�r erdkunde. In later years he travelled extensively, visiting Australia among other regions. Grahamstown Journal, 15 July 1890, p. 2, South African Geological Association. Hugo, P.J., Schalk, K.E.L. & Barnes, S.J. Bibliography of South West African/Namibian earth science (Introduction and references). Windhoek: Geological Survey of South West Africa/Namibia, 1983. Kienetz, A. Nineteenth-century South West Africa as a German settlement colony (p. 474). PhD thesis in social geography, University of Minnesota, 1976. Facsimile by University Microfilms International, Ann Arbor, Michigan, 1977. Logan, R.F. Bibliography of South West African geography and related fields. Windhoek: SWA Scientific Society, 1969. Marloth, R. The progress of natural science in relation to South Africa during the last ten years. Transactions of the South African Philosophical Society, 1890-1895, Vol. 8, pp. civ-cxxi. Rogers, A.W. The pioneers of South African geology and their work. Transactions of the Geological Society of South Africa, 1937, Annexure to Vol. 39, pp. 1-139. South African Committee for Stratigraphy (SACS). Stratigraphy of South Africa. Part 1: Lithostratigraphy.... Pretoria: Geological Survey, 1980.